Established in late 2002 after two years of development, Diagnose-Me.com began as a unique doctor-programmer collaboration. Being the first service of its kind, its future was uncertain at the time; what was clear, however, was the need for a much wider, deeper, and objective evaluation of patient symptoms than a doctor consultation could provide. Since then, Diagnose-Me.com has grown to the point where we handle tens of thousands of cases each year with a 99.93% satisfaction rate. Though it is now a rare occurrence, we still look forward to encountering never-before-seen problems. Diagnose-Me.com is based on the Big Island of Hawaii, employs U.S. doctors, and has other staff working remotely across the globe. How much does it cost? Can I get anything for free? How can I pay? Is it worth it? Why should I trust you? Are the results guaranteed? How can I be anonymous? This is personal information! What can be diagnosed? Who does the diagnosis? Doctor-computer comparison Do you use real doctors? Can I choose a doctor? How long will I have to wait? Can I see a sample report? I only have a small screen How will I receive my report? How do I save my report? How can I share my report? Can I print my report? What if I lose my report? Can I just ask my question? How does it work? How much does it cost? I have follow-up questions What if you can't answer? Our business is that of diagnosing the underlying health conditions that are causing your current signs and symptoms. While a doctor is generally only concerned with the current obvious problem, we view the human body as a highly interconnected whole and are therefore also able to highlight issues that are 'creeping up on you', even if they don't have obvious symptoms (yet). Your diagnosis is presented in an easy-to-understand (yet highly detailed), prioritized, color-coded report. 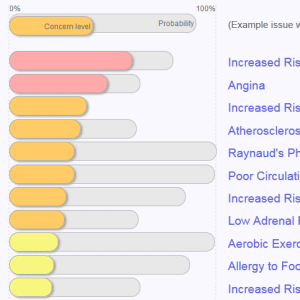 A graphical overview shows the 'big picture' of your health and links to the underlying details. All conclusions are fully supported by evidence and clear explanations, as can be seen in this sample Computer-only Analysis. We do not pretend that a diagnosis can be confirmed online: completing a diagnosis requires lab testing, physical examination, and/or trial-and-error treatment. However, we do narrow down the possibilities to just a few (including those that might be missed or ignored by a doctor with limited time), making it a simple process of ruling out (or confirming) them one by one. If you would like to have your case handled by a named, licensed, and contactable human doctor, our doctors are available for reviewing your situation, dealing with your specific concerns, making suggestions, and answering your questions and follow-up questions. 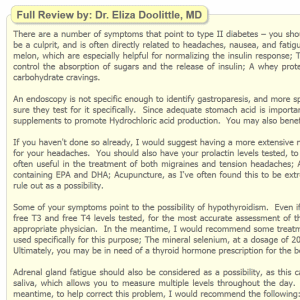 Here is a sample Doctor-reviewed Report. Identify all of your symptoms. This is a vitally important step since easily-missed signs or symptoms often hold the key. Build a shortlist of disease conditions. Apply thousands of weighted connections from signs, symptoms, risk factors and other causative conditions. Perform a differential diagnosis. Narrow down the possibilities by distinguishing and ruling out different diseases that share common symptoms. Consider all possibilities. Diagnosis is not a black-and-white science. If no single disease or condition exactly matches your symptom profile, two or more may be present and overlapping. Why are we different from other services? Search engines are excellent sources of medical information, but only when you know what to search for. They do not piece together the many clues that your body provides. Some web sites simply provide online access to human experts (doctors). We offer this as an option, but we also understand that a human doctor does not have the time or ability to ask possibly hundreds of questions in order to get to the bottom of your problems. The Analyst™ has the time and knows exactly what to ask. Most diagnostic systems lack depth: few ask more than 10-100 questions. This is clearly insufficient to cover the hundreds of signs and symptoms that people can and do have. Some systems start by asking you "What symptoms do you have?" or "Click on the area where your symptoms are", assuming that you know exactly what qualifies as a symptom, and that all symptoms are obvious to you or in one area. The Analyst™ makes no such assumptions: you will be asked all manner of unusual questions because, taken together, these small pieces of information make up the complex puzzle that is your current state of health. Some systems are broken down into components, for example the "Back Problems" module or the "Endocrine" module. Not only does this type of system fail to take into account the "big picture" (by viewing your body as an integrated system), but once again the assumption is made that you know what is wrong. Free systems are invariably geared towards selling products, not determining whether you actually need those products: A few questions are asked and you receive a recommendation for what to buy. The Analyst™ is not an advertising gimmick: you receive impartial findings and advice. We do not sell any treatments or other products. The Analyst™ takes the safe approach by first looking for natural solutions. For example, lifestyle and diet changes will always be considered before pharmaceutical drugs, which are mentioned only in cases where there are no effective natural treatments. For less than the cost of a rushed doctor's visit or a short-term "take this bottle of pills and see if it improves" solution, you can receive a far more in-depth evaluation of your health than you are likely to receive from any other source. We offer a 100% money-back guarantee that we will find all significant health issues that are affecting you. A highly detailed analysis of your state of health by The Analyst™, NOT reviewed by a doctor. A highly detailed analysis of your state of health by The Analyst™, reviewed and summarized by a named, licensed doctor who will give your case 10-15 minutes of his or her personal attention. Your doctor (named, licensed and contactable) will spend 30-40 minutes reviewing and extensively commenting on your case, performing additional research, adding his or her insights, and answering any specific questions that you might have. All reports include the in-depth computer analysis by The Analyst™. Your report can be upgraded later by simply paying the price difference. If you select a doctor-reviewed report, your doctor will be available to answer follow-up questions at no additional charge. Can I get anything for free? Yes. If you decide not to order a complete report initially then our system will send you a free Preliminary Analysis of your case by e-mail within a few hours. 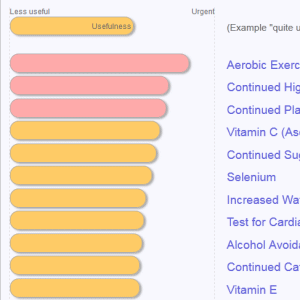 This Preliminary Analysis will provide you with your LifeMeter® reading (if selected) and an overview of your health and risk factors, highlight specific issues and recommendations, but will not go into much detail compared to a complete report. We accept credit or debit cards, PayPal, checks drawn on a U.S. bank account, or (for anonymity) money orders. All transactions take place on a secure server. Non-US residents who do not have a credit card can obtain an International Money Order from their post office or Western Union®. would like a second opinion. By looking at the sample (a real report that was sent out, with just the name changed), you can decide whether you would like one. Your report would of course be based entirely on your own responses and notes. Click here to read feedback from hundreds of past clients. Diagnose-Me.com has been in business since 2002, serving over 100,000 clients while maintaining a BBB rating of A+ (their highest). Credit card companies and PayPal will not deal with a disreputable business. Diagnose-Me.com accepts all major forms of payment. All of our reviewing doctors are named, licensed and contactable. As you probably know, it is illegal to practice medicine without a license. Unlike your own doctor, we guarantee our results. We guarantee that we will discover all significant medical conditions that are affecting your health, or we will refund your payment in full. Please see our guarantee for full details. How can I remain anonymous? There is no need to enter your real name on the questionnaire, and your report can be sent to a temporary e-mail address such as Hotmail. When it comes to credit card payment, you do not need to enter your real name or address: We simply need the correct card number, expiry date and postal/ZIP code. Alternatively, you can have someone else pay on your behalf. I'm concerned about giving out personal information. Tell me about the Questionnaire. Our questionnaire has been painstakingly compiled over the years in order to extract maximum useful information about signs, symptoms and risk factors. At over 900 possible questions, it is more comprehensive than any other on the Internet; it probes depths that no single physician has the time, skill or will to deal with. Click here to see the contents of the questionnaire. The human body is extremely complex; there are thousands of possible conditions and hundreds of related signs and symptoms. The Analyst™ does far more than simply connect a few obvious symptoms to a few common conditions. We don't want to ask so many questions... but we have to. Bear in mind that this is a "drill down" questionnaire and many questions will be skipped. For example, if you tell us that you are a non-smoker, you will not be asked smoking-related questions. If you tell us that you have joint problems, you will be asked detailed questions about those. Can I stop and continue later? Yes. You can leave the questionnaire at any time and return later. The system will remember your progress, and send an email reminder after a few hours. You can start on one device (for example your phone) and continue on another (for example your laptop). Can I submit images or recent lab test results? In the questionnaire: Towards the end of the questionnaire is an optional section where recent lab test results may be entered. Via email: If one of our doctors reviews your case, he or she will be happy to examine any images or recent lab test result documents that you wish to submit. Simply attach them to an e-mail message and include the name or e-mail address that was entered on your questionnaire, or your reference number if you have one. While lab test results may help to confirm or rule out certain conditions, they are not required. What types of problem can The Analyst™ indicate? Click here to see some of the more common conditions that we encounter. Your report will include up-to-date information not only on what we uncover but also about conditions already known to you and that you are in danger of developing. 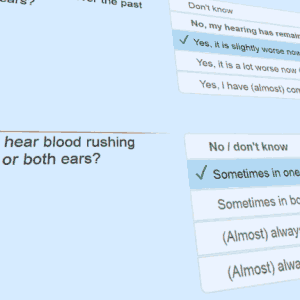 Am I being evaluated by a doctor or a computer? One or both, depending on your choice. The Analyst™ is a computer system that processes your responses to the questionnaire in a way that no human could, to produce a detailed evaluation of your health. For a doctor-reviewed report, the doctor assigned to your case will review the results, answer specific your questions and make adjustments according to any extra notes that you have entered. If you would like to read about some of our doctors, click here. 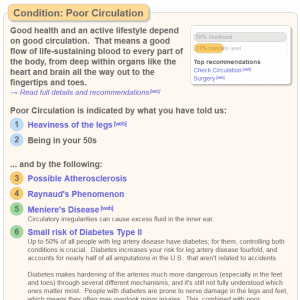 If you are unsure about involving a doctor, you can select the Computer Analysis and decide after reading it if you need a human doctor's opinion or have questions for a doctor. How can a computer system be better than a doctor? Shows you the full reasoning behind its findings Tells you "Trust me, I'm a doctor"
How can I be sure that you use real doctors? We use only named, licensed and contactable physicians; it is illegal to practice medicine without a license. You may of course opt for the Computer-only Analysis and discuss it with your own physician. Can I choose which type of doctor reviews my case? Yes. You will have the opportunity to choose from a male or female doctor, either MD (Medical Doctor), ND (Naturopath) or DC (Chiropractor). If you would like to read about some of our doctors, who can be chosen specifically to review your case, click here. If you prefer, we can choose the most appropriate doctor for your case according to any restrictions that you place. How long will I have to wait for my report? The Analyst™ will have a Computer-only Analysis ready within hours, but a doctor reviewing your case will require more time in order to give it their undivided attention. Standard Doctor-reviewed Reports are completed within an absolute maximum of 3 business days, and Full Doctor-reviewed Reports within 4 business days. Our doctors aim to complete their reviews within two calendar days, usually working on weekends to achieve this goal. Click here to see a sample report. Your report can be in HTML or PDF format, and password-protected to prevent others from reading it. Can I view my report on a small screen? Yes. The HTML (web page) format report can be viewed using any browser on any computer, tablet or phone, no matter how small the screen. The PDF format report is only recommended if you are using a computer. Your report is uploaded to a private location on our website. We then send a link to your report by email, which will take you to your report just like any other web page. If you have problems saving your report, or if you simply prefer it, we can also send your report as an email attachment upon request. How do I save my report? Both report formats (HTML and PDF) are single, fully self-contained files. In other words, no remote images, scripts or other external resources are required. Your report file can be saved to your computer just like any web page. Once saved to your computer, it can be viewed without an Internet connection. When saving a web page to your computer, most browsers offer the option to save as "Web page, complete" or "Web page, HTML only". Either option is fine, and will result in only one file being saved. How can I share my report? It is certainly possible to print your report. See Instructions for printing your report. Please note, however, that your report is best viewed on a computer because of the many hyperlinks to external web pages and other sections within the report. An HTML (web page format) Sample Report or PDF Sample Report can be viewed or printed. If printing, we advise only printing the first few pages, as the reports are long. What if I lose my report? If you ever lose your report, simply contact us and we will send you another copy. We regularly resend reports to clients who used our service several years ago. Can I just ask my question? How much time does the doctor have to write an answer? A short question without attachments might cost $10 to answer, whereas longer questions with attachments that require more extensive responses would cost incrementally more – you select your desired response level. If you require further clarification of the doctor's answer, he or she will be happy to respond at no additional charge. New and unrelated questions, however, will have to be asked through our website in the usual way at the Ask A Medical Question page. What if the doctor cannot answer? If the doctor is unable to answer your question then we do of course provide a full refund. Whom do I contact with questions about my report? If you have a complaint, please see our guarantee. If you have follow-up questions for your reviewing doctor, submit them by email and he or she will be happy to respond. For any other questions, either reply to one of our e-mails or contact us here. I made a mistake or forgot something. What can I do? Don't worry, we're very accommodating and here to help. If you need to add or change something in your questionnaire and receive a revised report (no charge), that's not a problem. 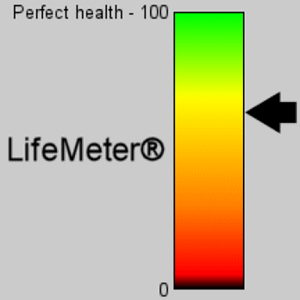 If you did not select the LifeMeter® option but now want it, that's easy to fix. For these or any other problems, either reply to one of our e-mails or contact us here. How can I get help with the web site? Contact us with a detailed description of your problem.